Lucy and Ethel are tasked with packaging each chocolate candy by hand as it moves past them on a conveyor belt. But the conveyor pace quickly gets out of control, and they are left trying to keep up. This is not unlike what is expected of nurses in our modern day health care system. We ask them to work miracles with missing equipment, broken processes and more. “Fighting fires” is pervasive in other industries. However, I cannot think of an equivalent scenario of such a large number of workarounds required by anyone else in any other industry as there is with nursing. This has a lot of negative impacts. Let us take a closer look at this issue. Another study documented the top tasks nurses performed not related to their jobs (non-nursing tasks), and the top nursing tasks left incomplete – all related to patient care. Image source: “Creating a Culture of Collaboration Between Nursing and Support Services in the Clinical Setting,” White Paper, AONE. Research conducted by Tucker and others found that nurses experience an average of 8.4 work system failures per eight-hour shift. In an eight-hour shift, nurses were interrupted mid-task an average of eight times per shift. 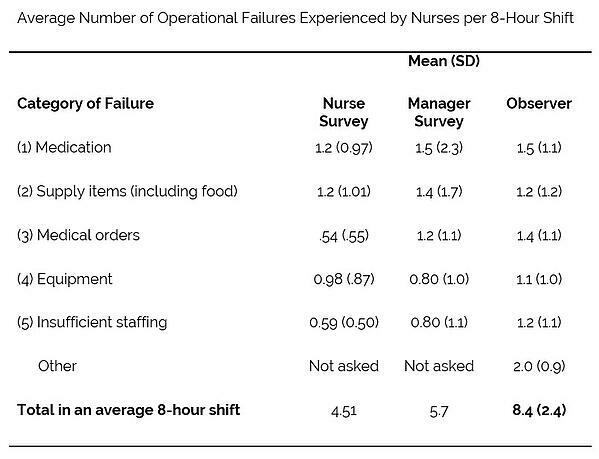 Image source: “Operational Failures and Interruptions in Hospital Nursing,” https://www.ncbi.nlm.nih.gov/pmc/articles/PMC1713207/ Anita L Tucker and Steven J Spear. In her article on workarounds (linked to earlier), Tucker hypothesizes that these types of additional tasks increase nurse workloads from five patients per nurse to 5.3 patients per nurse. Ask any nurse why they got into nursing, and tasks related to hunting for IV poles and patient charts is likely not on their list. Why Do So Many Workarounds Exist? 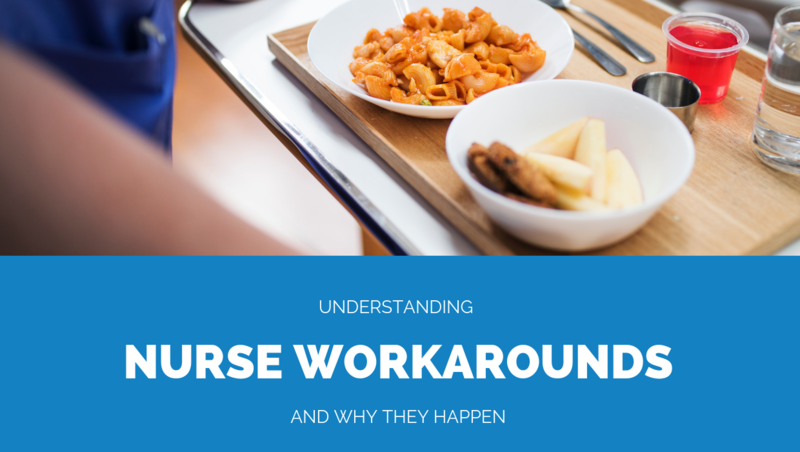 Workarounds exist for many reasons, including the fact that many nursing workarounds are better solutions to the procedures that are already in place. Most significantly, workarounds benefit the nurse's or doctor's current patient, who receives the intended care. This can be gratifying to individual caregivers, which reinforces the positive aspect of workarounds. Unfortunately, workarounds become the norm. In Tucker’s research, she found that health care professionals usually work around the immediate issue without taking steps to prevent further reoccurrences of the workaround. 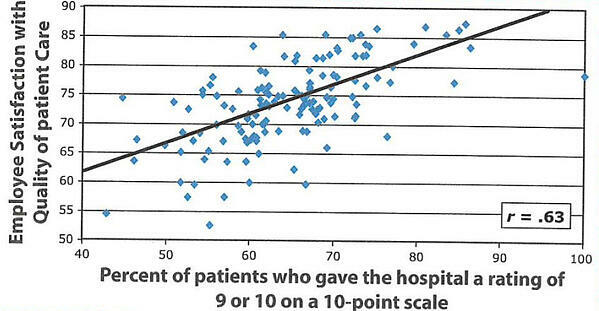 This pattern of behavior, called first-order problem solving, seems successful because patient care continues in the short term. However, the downside of first-order problem solving is lack of communication, which hinders real improvement from occurring for several reasons. First, workarounds often merely transfer the problem to another location, such as one unit's secret hoard of equipment that causes shortages in other locations. Second, the lack of communication about failures keeps managers and relevant personnel unaware of the need for change, and therefore problems are not investigated to find and remove underlying causes … Thus, similar problems are likely to recur. A hospital culture that supports workarounds has created expectations that nurses will, once again, save the day by performing them. We can thank them for being the heroes. But this doesn't fix the problem. We need operational workflows that eliminate the workarounds and help nurses focus on what they do best. Happier nurses and more time dedicated to patient care. Nurses want to be able to do their jobs well, and that means focusing on patient care. 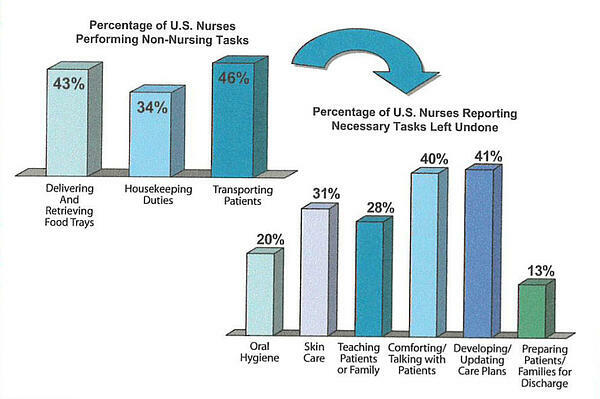 Image source: “Creating a Culture of Collaboration Between Nursing and Support Services in the Clinical Setting,” AONE. It makes financial sense. Nurses are expensive help, so we need to deploy them strategically. Why pay a premium for a nurse to do tasks that staff at a lower pay grade could do? To maximize the performance of your workforce, each employee should be working to his or her highest potential. In this case, you need each staff nurse working at the top of her license. Lucille Ball made workarounds funny in the chocolate factory episode of “I Love Lucy.” But the workarounds that our nurses face today are no laughing matter. There are efforts underway by leading hospitals to help address nursing workarounds. In my next blog posts, I will discuss two models that can help you eliminate nursing workarounds if you’re facing a similar problem. The second model, the Nurse-Ready Patient Room model guarantees a nurse has everything she needs for patient care by ensuring a 100 percent ready room with each new patient admission.